February 2, 2015 – Adams State University and Title V Science, Technology, Engineering, and Mathematics (STEM) Saturdays continue to offer free interactive sessions open to the public. Registration is required for the sessions, designed with specific grade-level, developmentally appropriate lessons in mind. February 7 – Programming NAO Humanoid Robots, George Sellman, assistant professor of computer science, grades 6-7; enrollment cap is 12. 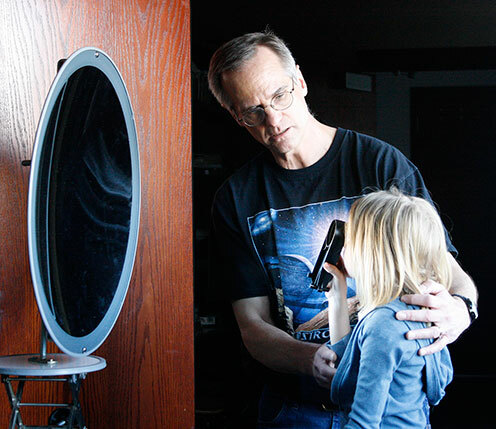 February 14 – Optics, Telescopes, and the Sky, Dr. Robert Astalos, associate professor of physics/director of the Zacheis Planetarium and the Observatory, grades 5-8; enrollment cap is 16. February 28 – Creating and Controlling Lego Robots, Dr. Matt Nehring, chair of the chemistry, computer science and mathematics department, grades 4-6; enrollment cap is 14. March 14 – So you think you can’t math, Raquel Barata, visiting assistant professor of mathematics, grades 6-8; enrollment cap is 16; Girls Only – an ASU Women’s Week event. April 4 – Investigations in Biology, Dr. Kristy Duran, assistant professor of biology, grades 4-6; enrollment cap is 16. April 11 – Extracting DNA from Cells!, Dr. Adam Kleinschmit, assistant professor of biology, grades 6-8; enrollment is 16. May 2 – Advanced Programming HAO Humanoid Robots, George Sellman, assistant professor of computer science, grades 6-7; enrollment cap is 12. Programming NAO Humanoid Robots: The NAO is a 58-cm tall humanoid robot. It is small, cute and round. The NAO is intended to be a friendly companion around the house. It moves, recognizes you, hears you and even talks to you. Students will program the NAO to move, speak, and respond to commands. The Optics, Telescopes, and the Sky will start in the physics lab, where students will use lenses and mirrors to create, observe, and magnify images. They will gain hands-on experience with magnifying lenses, and create two different types of telescopes. We will then move over to the planetarium to learn about the parts of an astronomical telescope, and we will use it to safely observe the Sun (weather permitting). Finally, the class will move into the planetarium theater to see some of the sights of the night sky, including constellations, planets, double stars, nebulae, and galaxies. In the Creating and Controlling Lego Robots workshop, we will begin by watching a 30-minute program at ASU’s Zacheis Planetarium titled Robot Explorers. At the conclusion of the planetarium show, we will return to Porter Hall where students will learn about robots, modify and construct robots, and learn how to create efficient computer programs that will control robots. During this experience we will consider some of the challenges that NASA engineers are confronted by when they develop robotic missions for exploring the solar system. Priority will be given to students who have not participated in previous STEM Saturday Lego Robots workshops. As part of Adams State’s celebration of International Women’s Week, So you think you can’t math includes a variety of interesting, challenging, and fun activities that explore some obscure sides of mathematics. Students need only bring their enthusiasm for mathematics and learning to this event. This session is open only to girls in middle school. Explore the science of biology in ways that may surprise you. Join Duran and several college students as they guide students on a journey of scientific investigation during the Investigations in Biology. Extracting DNA from Cells! : Students will learn about the basic components that make up a cell, the simplest unit of life, while extracting DNA from strawberries. Armed with the knowledge of how laboratory reagents can be used to extract DNA from cells, students will have the opportunity to explore the effects alternative reagents have on the efficiency of DNA extraction. The session will wrap up with participants having the opportunity to extract their own cheek cell DNA. The session, Advanced Programming HAO Humanoid Robots, will explore more advanced features of the NAO Robot. The session is open only to students who have previously completed one of the NAO Programming workshops, either Oct. 25, 2014 or Feb. 7, 2015.